On the surface, and judging by the beautiful cover, Seaglass is a ghost story. And it is – a full-on spooky, unsettling one. It’s well-paced, and the mix of scares and humour work effectively to increase the reader’s apprehension, then release tension. Not suitable for the timid! But there is also an emotional story at a deeper level, ideal for more experienced readers. I really cared about the characters, especially Lark, and that made the haunting all the more frightening. Without giving spoilers, I’d say you’d want to read right to the end to fully experience ‘all the feels’. One of my favourite aspects is the lovely details which establish the essential Welshness of the setting and characters – without alienating readers less familiar with the principality. It’s also full of convincing young people: their flare-ups of emotion are entirely credible. I’d add that characters of different ages are handled well and the whole story is unnerving, poignant, and often funny by turns. 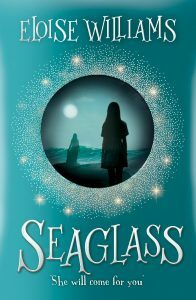 In short, Seaglass will frighten, amuse and satisfy readers who enjoy heartfelt family drama with a supernatural element. Perfect Autumn reading. This entry was posted in Review and tagged Eloise Williams, family drama, Firefly Press, ghost story, Seaglass by KMLockwood. Bookmark the permalink.